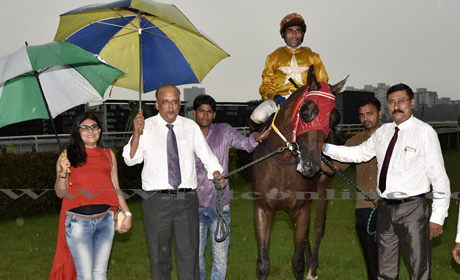 Trainer Javed Khan`s charge, Brahmachari (C.S. 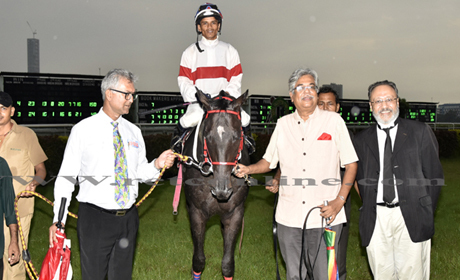 Jodha-up) easily claimed Tuesday`s feature event, the 1,200m Time Machine Cup. 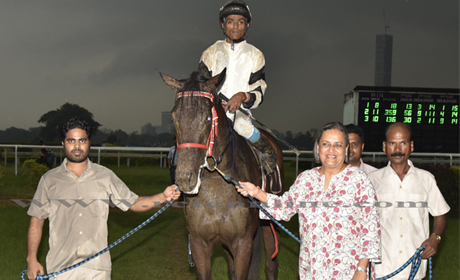 Jodha also helped the trainer`s Vice Admiral score to further his schooler`s tally to three as jockey Ranidan Singh had given the veteran professional a kick-start through a rank-outsider, Xlite`s victory, early in the eight-event card. 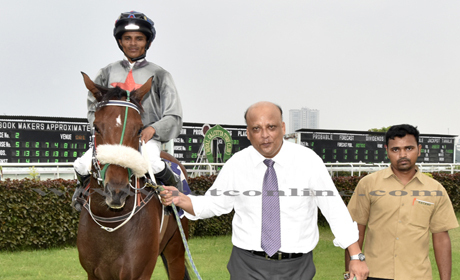 Brahmachari`s victory in became apparent after jockeys Pradip Chauhan`s and Dashrath Singh`s absence, following the sad demise of the western India trainer Magansingh P. Jodha, early on the race day. 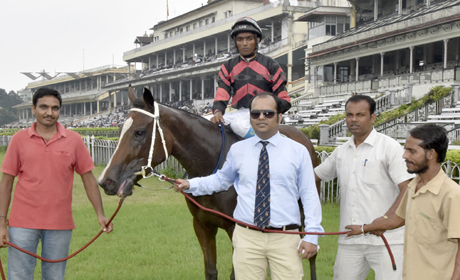 While Dashrath had no ride in the feature, Chauhan`s absence was felt as he was expected to play a major role on trainer Vikash Jaiswal`s chance runner, One Man Army. Ridden by Hindu Singh, the horse did manage to lead, comfortably, till about the final 100m of the race but failed to hold on to the advantage. Jodha, on the other hand, nursed Brahmachari, close behind the leader and the 2/1 favourite, Amorous White (app. P. Vikram), another of Jaiswal runner. Given a free hand inside the final 150m the six-year-old flew past the two front runners to score untroubled. Vice Admiral, on the other hand, was ridden off the pace, in the 1,400m Fairy Handicap, but the Lord Admiral son, also a six-year-old, stamped his superior class, accelerating admirably along rails in the last furlong of the race. Javed`s Xlite made her intension rather clear from the midway of the journey in the upper division of the 1,100m Select Handicap. Known for her comfort over longer sprints, the Sussex filly joined the issue 400m from home to sail away to a length-plus victory. The lower division of the race was also an easy pick for trainer James McKeown`s long-shot, Rising From Ashes (app. Vikram), who was brought with a rush from way back in the final furlong to topple a heavily fancied Jaiswal-runner, Born To Win (app. Sujit Paswan). Princess Elena (Hindu), another heavily fancied, rather an odds-on favourite, however, managed to deliver the goods in the day`s opener, the 1,400m Bold Display Handicap. 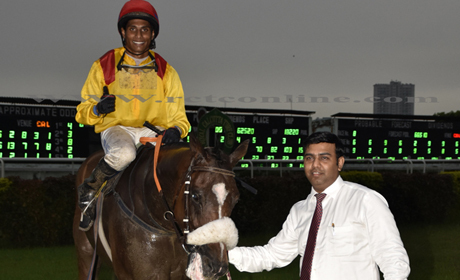 The Top Class filly, from trained Manvendra Singh`s stable, did give some anxious moments till about the home turn but once in the motion she covered a good ground, on the wide out to score with a degree of ease. Trainer Arti Doctor, too, had her share of luck in the day`s card. Her three-year-old filly, Fire Opal was heavily fancied to win the 1,400m La Gitana Plate and the Arazan-Zephyrella daughter scored easily after being asked to chase trainers Vijay Singh`s fancied runner, Romanoff, Bharath Singh`s General Duff and, Manvendra`s Boss and Raunak Banerji`s Romantic Zeal. 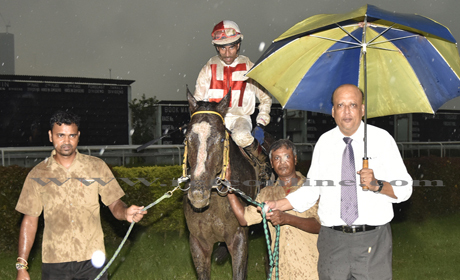 Fire Opal beat a late-finishing Harbinder Bath`s youngster, Expensive Affair (B. Mahesh). More may be heard of Bath`s horse in future. Manvendra`s 7/1 shot, Midnight Star (Hindu) came close to beating the 3/1 fancied runner, Gryffindor (C. Alford), in the Vibrant Handicap. Midnight Star and Gryffindor were seen chasing Vijay`s Dangal in the early half of the journey but the later always had an edge in the final furlong. 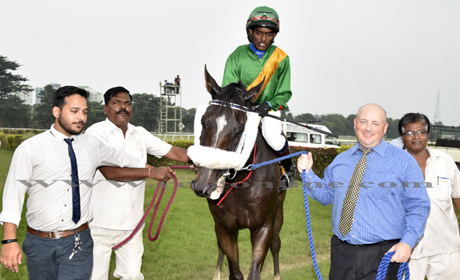 The afternoon concluded with an upset victory of Jaiswal`s 5/1 shot Jester (Nikhil Naidu) who was well in at the weights but considered to be unsuitable over the mile and-a-quarter trip of the Whiplash Handicap. The Ace-Champagna Polka son, however, tackled the week opposition to score easily.